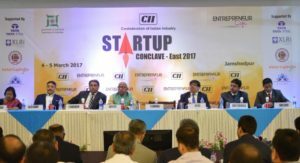 Jamshedpur: XLRI – Xavier School of Management recently hosted entrepreneurship conference the 1st-ever ‘Startup Conclave East 2017’. The conference was organized by the Entrepreneurship Cell (E-cell) of XLRI in collaboration with Entrepreneur Café on 4th and 5th March, 2017. The conference aimed to provide opportunity local start-ups to interact with industry experts and gain insights over how to better their business and also to provide insights about current start-up policies. The inaugural session was graced by eminent industry leaders and dignitaries including Mr. T. V. Narendran (Chairman, Board of Governors at XLRI & MD – Tata Steel India and South East Asia), Mr. A.B. Lall (Chairman, CII Jharkhand State Council and Plant Head, Tata Motors), Mr. Sunil K Barnwal (IAS, Secretary to the CM of Jharkhand and Industries, Mines, Geology and IT, Government of Jharkhand) among others. In their addresses, Mr. A B Lall, stressed on inclusive growth oriented business models while Mr. TV Narendran talked about how apt the time is for entrepreneurship, backed by political pace and will. In his speech, Mr. Sunil Kumar Burnwal, focused on creating startup ecosystem where anyone with an idea should feel encouraged to start his own venture and become job creator instead of job seeker. He said, “It is our responsibility to change mindset of people coming from rural background and inculcate startup culture in their mindset from childhood.” He also discussed about the Jharkhand Innovation Lab initiative of setting incubation centers in cities like Jamshedpur and Dhanbad. The Chief Guest of the conference was Shri Saryu Rai, Hon’ble Minister, Parliamentary Affairs, Food, Public Distribution and Consumer Affairs, Government of Jharkhand. In his speech, he stressed upon the focus to solve problems related to Production and manufacturing by creating and maintaining startup hubs through Startup conclaves like these. Addressing the next session held at XLRI campus, Fr. Oswald Mascarenhas, S.J. (JRD Tata Chair Professor of Business Ethics at XLRI) stressed upon the importance of Startups, and how India will be home to over 12000 startups by 2020. He also discussed about the need for large corporations to reinvent the wheel, lest they face an existential crisis. Mr Manish Harodia, alumnus of IIM-K and founder of Dream Wallets, spoke on his unique take on investing and raising money for start-up ventures. He stressed on the need to invest in one’s own idea and had wise words for the budding entrepreneurs. The Day 2 events commenced with keynote speech by Mr. Umesh Shah (Director, IT Department, Government of Jharkhand). In the address, he threw light on the world of opportunities and support extended by the government of Jharkhand for entrepreneurial ventures, and reiterated how Jharkhand is going to evolve exponentially with the onset of ‘Momentum Jharkhand’. Mr. Aditya Sharma (Representative of Startup India Hub) familiarized the audience with various policies that are offered by the Department of Industrial Policy & Promotion, including helpline number 1800115565 which, along with email and social media channels has resolved over 34,889 queries since April 1, 2016. The second day of the conference held various interactive events such as shark tank pitches that were participated by local Jamshedpur startups like Pitstop Service, and online bike solutions service, TEchnobright, a technical education providing interface and Blue Elixir water harvesting systems among many others. Interactive session on Design Thinking was coordinated by Prof. PK Dan (Chairman E-cell IIT Kharagpur). Mr. Nav Kishley (Trainer, Smile Foundation) brought various legal aspects to the fore and introduced many frameworks for the use of budding entrepreneurs. Mr. Baldev Singh Rawat held session on Bootstrapping as the best strategy, while sessions on Analytics by expert Dr. R. Simbasivam (Head analytics, Tata Steel) and Innovation and IOT by Dr. Arvind Choubey (Professor, NIT Jamshedpur) were also held. The conference concluded with the session by Mr. Sarajit Jha of Tata group, who talked about trending technologies and gave important insights on ‘when to stop investing’ to startup enthusiasts.